what is your favorite water transportation? who else would be in your boat, and where would you be - lake, ocean, etc.? in my ideal, i am canoeing on a peaceful lake in maine with my mother. she is bossy, and tells me on which side to put my paddle. this doesn't bother me, however, and we have a relaxing conversation as we go under the bridge and into the smaller part of the lake. we see the plants coming up through the water, and push off rocks with the oars to avoid getting stuck. the weather is lovely, so while we are getting exercise, it's not strenuous. when finished, together we drag the canoe out of the water and turn it upside down on the wooden rack. to me the ohio river is art. to others, it's a place to take a boat, park outside the riverbend music center during a concert and enjoy the fresh air and music. yet, it's still a highway, a practical place to transport really big goods. so tiny, you might not be able to see it, was a kayak. one person, tiny boat, big river. i watched her lead the way into the water. there's where the idiom comes from - they took to swimming like a duck to water. what alice forgot is already gone. a friend is going on vacation tomorrow, and there it went - pure entertainment for a long car ride. luckily i had her snap this photo before they left. 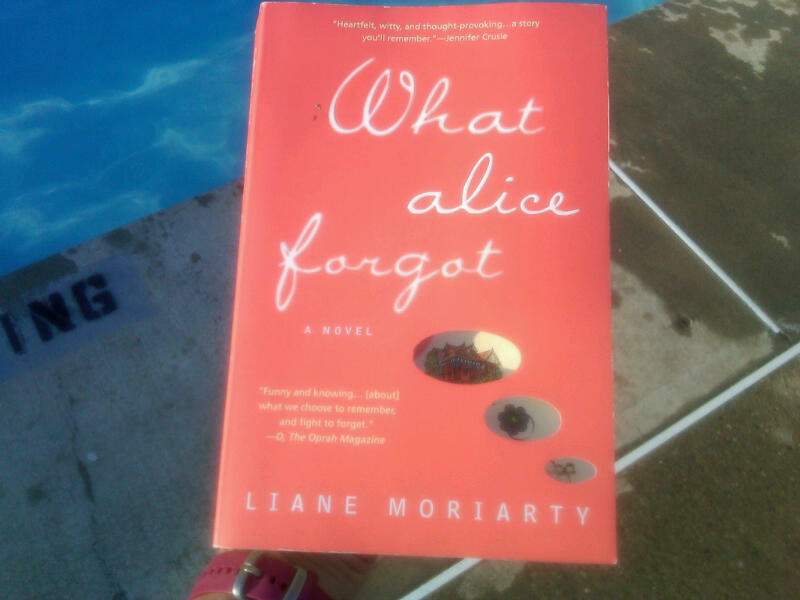 in this book, alice wakes up on a cold gym floor. she's 29, expecting her first child, and can't remember what she ate for breakfast. the emts are gentle, but the stretcher carries her past people who know her, whom she does not recognize. alice is deeply in love with her husband, and can't understand why he does not come to the hospital. one shock follows another. she's not pregnant. she's getting divorced. she has 3 children and is really 39.
whew. that was some concussion. i recommend this book for poolside, traveling, or stress relief reading. it captures your attention, and keeps it. best of all, when you finish reading, you still have lots to think about. what would your younger self think of your life today? it's hard to see, but the blue is what we're looking for. but are looking for only these. home from singapore, safe and sound. don't you love big cardboard boxes? and a radio, just in case there is a baseball game on. electric eel. did you know their stomach and body functions are very close to their head, and the rest of the long body is used to create the electricity. very interesting creature! ray shark named "sweet pea"
at the exit, you can see the above-the-water view. wow. newport aquarium - highly recommended. and saw this nice view. nice view of the polar bear habitat - next time i'll share the bears. at greenfield, you walk through a little "covered bridge" to enter. the tortoise on the table? lesson learned: bring your camera when you go buy flowers.